Our youngest users start on the Yellow track in order to gain safety. Here they can expect the Mushrooms-walk, sledding, walking through tunnels and the trapeze, which mostly lures out a cry of joy. The overcoming of the Yellow track effects the psychomotor development, particularly among the youngest users. 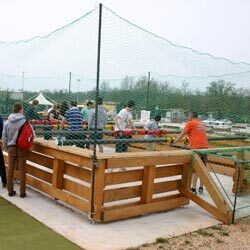 The next level is the Orange track, which is the first, which is used by the adult users. 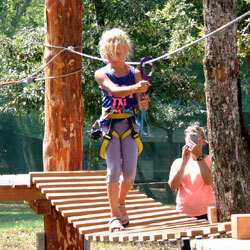 It features a cable car ride, balance exercises on scales, flying cycling, climbing, walking on beams and ropes, strength exercises on the trapeze, and it ends with a ride on the zip line. 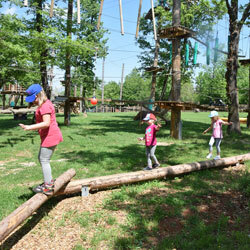 The adventure continues on our Blue track, specially prepared for children and adults. 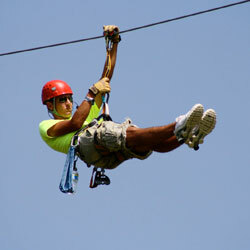 Visitors can enjoy in 250 m of pure fun, with a zip line extending over the entire park. The Red track is a special experience, which is located at a height of 10 m, and its mastery brings a special treat of testing your own strenght. The track is ideal for all visitors who are looking for a real adrenaline rush and movement complexity. 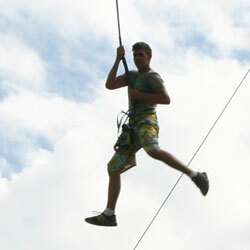 Feel how it is to swing on a height of 7 meters, in a group or alone. 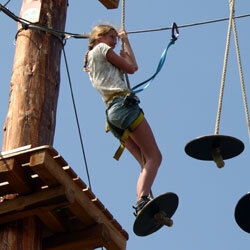 When you tie yourself up, we lift you up to a height of 7 meters, let the swing go and you swing with your own inertia. All of us, who use to spin figurines on Table football, now have the opportunity to become figures ourselves. Table football the size 12 x 6 m and fun for 8-12 users. There is also the possibility of organizing tournaments with awards, like trophies and medals. Billiard lovers will be thrilled. 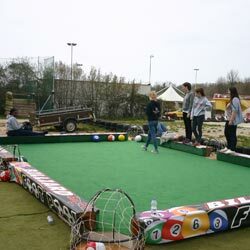 Namely, we created a billiard table the size 7 x 5 m where you play billiard with your feet instead of a stick. We can also organize tournaments, and the number of players is from 2-4. 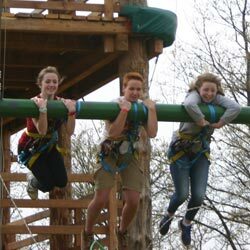 By crossing the selected tracks the users have the great pleasure of using the free-fall system, or the Quick Jump from a height of 10 meters. In order to calm accumulated adrenaline, our amusement park offers all users the possibility to relax with cold drinks at the bar with rustic tables in the shade of oak trees. 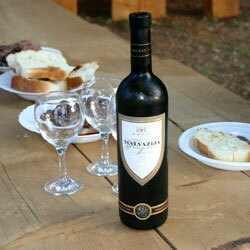 The use of the park does not require special physical readiness, but only the will and desire for fun and excitement. Your fun is our pleasure!